CEBU CITY – Young players from the south get to learn football from coaches of one of the world’s most successful sports clubs as the FC Barcelona Escola Football Camp kicks off on October 26 at the Aboitiz Sports Field. A five-day event under FC Barcelona Escola, the official football school of four-time European champion FC Barcelona, the camp has a program designed and patterned from the first team of FC Barcelona. FC Barcelona Escola Camp Philippines opened its first training camp in the Philippines in April 2013 at Alabang Country Club followed by another camp at Emperador Stadium in Taguig. The Cebu camp’s launch on Thursday was headed by Carles Martin of FC Barcelona Escola Asia Pacific, Cebu Football Association president Ricky Dakay and brothers Nicholas and Michael Reyes of the organizing FCB Escola Camp Philippines and Team Socceroo. 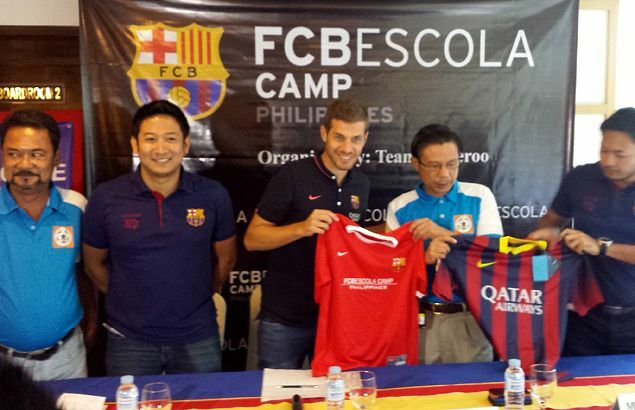 Two FC Barcelona coaches will supervise the camp along with several football coaches from Cebu. “These coaches will be there every minute of the camp and they will be bringing the Barca experience to these players,” said Martin. An open tryout for underprivileged kids will be held, with eight to be selected to join the FCB Camp. “We’re not looking for the strongest, the fastest or the best player here. We’re not looking for the next (Lionel) Messi or Neymar. But we’re going to select players who best represent the Barca way,” said Martin in the press conference. Nicholas Reyes, Team Socceroo managing director, said that the Filipinos’ height and quickness is suited for the FC Barcelona brand of football. “They will not only learn good football but will also be taught values that can help them become good people on and off the pitch. This is really great for the development of football at the grassroots level,” Reyes said.